On July 8-12, the Baptist Fellowship Association (BFA), formally the Fundamental Baptist Fellowship Association, held its annual conference at Cedarville University. The theme was “Crossing the Bridge of the Ethnic Divide.” Attendees from BFA-affiliated churches from around the country, as well as local churches, enjoyed five days of preaching, teaching, workshops, and special activities at local churches and museums. Two Resident Directors from Cedarville, Jessi Dyson and Nick Boucher, participated in the conference, helping navigate important conversations about ethnicity and race. 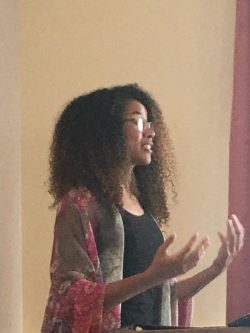 On Monday, July 9, Jessi, along with Dr. Janice Supplee, Vice President of Marketing and Communications at Cedarville, shared with almost 100 women about their experiences “living on the bridge” of the ethnic divide. The women met at Mill’s Park Hotel in Yellow Springs and enjoyed a catered lunch, then listened, laughed, and cried together. 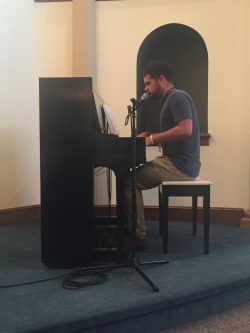 Later that afternoon, Nick, along with BFA leaders Tobias Monday, Ismael Dora, and Dr. Kezia Curry, filled Moffat Hall at Grace Baptist Church in Cedarville for an afternoon of music, discussion, and dessert. Different styles of music were played and discussed in small groups. The afternoon ended with cake and ice cream with friends and members of Grace Baptist and BFA attendees. New friendships were created, and old discussions were gently navigated. Experiences like this are important for Jessi and Nick, realizing that they are responsible for approximately 500 students on campus during the academic year and are instrumental in the students’ spiritual growth during their 1,000 days at Cedarville.